For the past three days I have been using ‘Dawn’ Beard Balm from The Old Norse and the scent has had me stumped. I have had a great deal of difficulty in trying to distinguish the individual scents that are in play! ‘Dawn’ Beard Balm from The Old Norse is a base of Unrefined Organic Shea Butter, Beeswax, Jojoba Oil, Argan Oil, Sweet Almond Oil, Apricot Oil, Avocado Oil with Sweet Orange, Ylang Ylang and Cinnamon Leaf Essential Oils for the ‘Dawn, scent. The result is a balm that is easy to scoop out of the pot and feels good on my beard, it did give my beard a softer yet natural feel and really like the feel and the result of the balm. This balm will not only keep your beard looking good, it will help to keep the skin under your beard in good condition and help to prevent itchy and dry skin. Now we come to the scent. 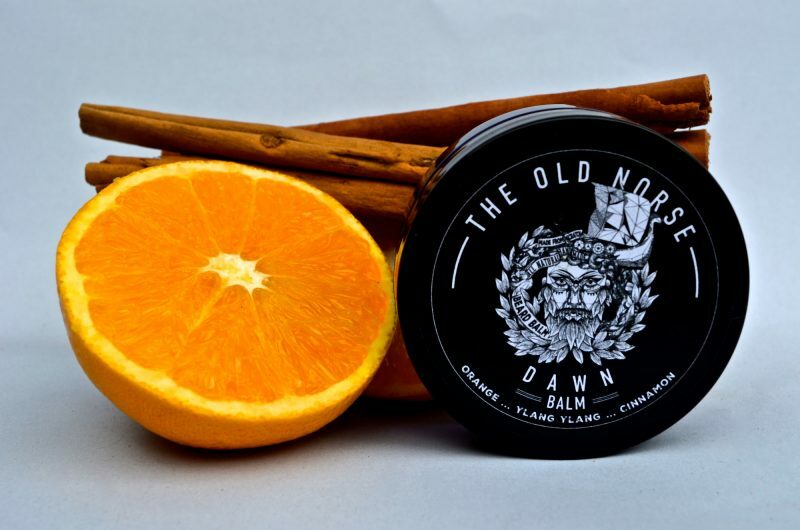 I love citrus scents in beard care products however when I applied ‘Dawn’ Beard Balm from The Old Norse I didn’t get that beautiful Sweet Orange scent! Instead I was greeted by the floral Ylang Ylang and a clove note from the Cinnamon Leaf with a background hints of Citrus and this is weird, rubber! Yes a very slight rubber scent and I questioned myself, my wife is very good at picking out the individual scents and she also said the same, a Facebook post to ask friends confirmed that a few also get rubber from Ylang Ylang with one friend saying it reminds him of Christmas and Durex? It’s important to mention that this is Cinnamon leaf which is spicy and can give off notes of Clove, its not Cinnamon bark which is sweet and warm and is shown in the photo taken from the website. Also it says Cinnamon Leaf in the description but in the ingredients list it says Cinnamon bark! For me I think that the sweeter Cinnamon Bark would have worked better, otherwise the Sweet Orange should sit foremost and with the Ylang Ylang and Cinnamon sitting just behind. However I am aware that scent is down to personal taste and this is just my view on this scent. I love reviewing beard care products but the thing I struggled with the most is the honesty, I have to be honest but its the thing I dislike about reviewing!!! We create all Natural Beard care products for the modern man. To Not have harmful chemicals involved was a big drive for me. To know that all the ingredients were 100% natural and still being able to achieve great results is something we strive for. We hand make these products with the best ingredients we could source. Our small scale production methods allow us to dedicate total care to each smooth balm and oil we hand pour and label up. We have been able to craft smooth, soft and goes without saying, great smelling Balms and Oils. The next step was discovering the science of essential oils. The benefits of these oils are astounding. With constant use they can benefit your beard no end. Whether it be to help prompt Growth, Reduce oily skin or Reducing irritation, they are a great additive to our products. Along with their amazing uses for the body they smell beautiful. In such a concentrated form the scents last a long time in your beard which allows you to enjoy them for hours in to your day. Who better to style my product mixtures on than the creators of all that is manly. The Old Norse. Having a beard in Scandinavia is pretty much mandatory. When surviving out in the harsh cold and wild you must know how to look after your skin, to keep it hydrated and rich with nutrients. Its from these group of countries that i have designed our products scents around. To match the ruggedness but beautiful scenery and smells that you can experience whilst there. As much as Men like to strive for masculinity we can’t help but still enjoy the better smells in life. So Join us and experience our Balms and Oils.